By now, you probably already know why chia seeds are awesome. For one, these tiny, pinhead-size seeds are rich in omega-3s — and they’re incredibly high in fiber, to boot. They’re so high in fiber, in fact, that they can absorb approximately 10 times their size and weight in water. These little super-soakers develop a gelatinous coating after they’ve taken in all that liquid, which lends itself to all kinds of interesting food uses. Puddings, smoothies, and — yep — a super-easy, healthy “jam” made with just berries, a little natural sweetener, and chia seeds. And that’s it! So today, I thought I’d show you exactly how you can make your own chia seed jam. But first, a little about jam. Traditional jam relies on pectin to gel, and if you’ve made it before, you know that it can be a fussy beast. The right balance must be struck between the fruit (and the amount of natural pectin it may already have in it), sugar, added pectin, and acid in order to create the perfect consistency. It can take a lot of time boiling and stirring and fussing and ultimately possibly cursing over a stove. Not that I know anything about that. But chia seed jam? It’s a piece of cake. And the result is a fruit spread with a similar texture as its predecessor, but it’s one that, to me, tastes more of the fresh, bright fruit it’s made of. Better yet, you can leave the sugar out entirely if you wish. Or if your jam needs to be a touch sweeter, pure maple syrup or some honey will do you just fine. Oh, and there’s also the nutritional boost that those super seeds provide. Probably the only downside is that you can see the seeds in the final product, which might look a little strange to unsuspecting diners if the fruit you’re using doesn’t usually look “seedy” in jam form. Chia raspberry jam, for instance, looks just like traditional raspberry jam, but traditional strawberry jam doesn’t generally have those seeds. One solution is to run the final product through a food processor or high-speed blender to puree the seeds. Here at our house, we don’t mind them. Quantity-wise, I’ve found that a pretty good formula to start with is 1 pound berries + 1/4 cup (optional) sweetener + 2 tablespoons chia seeds. Of course, the liquid levels in fruits and berries can vary, so you may need to add more chia seeds toward the end of the process to get the exact consistency you’re after. But that’s what’s so cool about this stuff. You can tweak and fiddle until you’ve got a jam you love. So are you ready for quite possibly the easiest jam ever? Here’s the step-by-step! For this batch of chia seed jam, I started with one pound of strawberries — washed, hulled, and chopped into quarters (chop them into smaller pieces if you want to avoid bigger chunks in the final product). If you’re using raspberries or blueberries, you don’t even have to chop. Just make sure they’re clean and you’ve discarded any that are under-ripe or past their prime. Add the fruit, along with a little sweetener if you wish, to a medium saucepan set over medium heat. I chose 1/4 cup of clover honey for this batch of strawberry jam. Pure maple syrup is another nice choice, and of course plain old granulated sugar will work just fine, too. The amount of sweetener needed, if any, can really vary, depending on your fruit. So if you want to wait until the end of the process to taste and then sweeten if necessary, you can. Once the berries heat up, they’ll start to liquify. 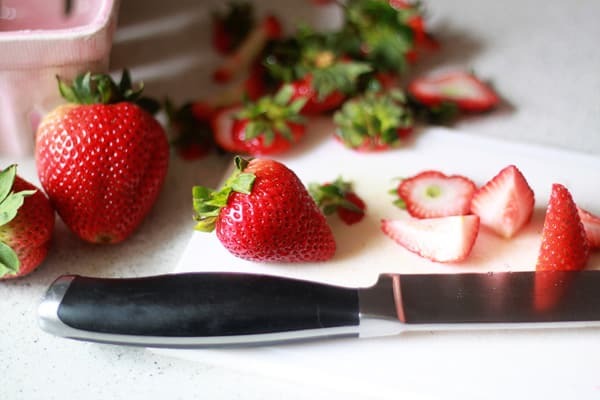 Carefully smash the fruit with a masher or fork until you reach the consistency you’d like. Allow the fruit to come to a boil, and let it continue to boil until it begins to break down and form a saucy consistency, about five minutes. Stir in two tablespoons of chia seeds and let cook for another minute. Stir again and remove from the heat. Let it sit so the chia seeds can work their magic and turn your lightly cooked fruit into an incredible, healthy jam. It should take about 10 minutes until it’s set and ready to eat. The jam will continue to thicken as it cools. If the jam seems a little thin, add another teaspoon or two of chia seeds, stir, and let sit for another 10 minutes. After the jam has cooled to room temperature, it’s ready to serve! Eat your chia seed jam just like you would any other jam and marvel over how easy that was — and how great it tastes! To store, place it in an airtight jam jar or other container, and keep it in the refrigerator for up to two weeks. Preservation note: We do not recommend canning chia seed jam — we don’t have enough information about whether or not it is safe to do so. 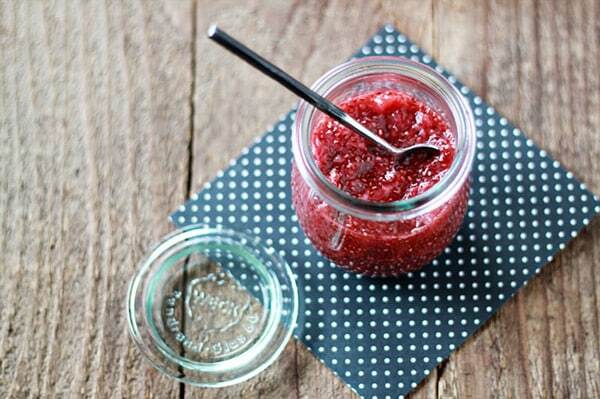 Decadent and healthy jam in minutes. That's the magic of chia seeds! Clean and process your fruit, removing stems/seeds as needed. Set a medium saucepan over medium heat and add the fruit and sweetener (start with a little; you can always add more later). Heat fruit, stirring occasionally, until it begins to liquify, 5-15 minutes depending on your fruit. Allow the fruit to come to a boil, and let it continue to boil until it begins to break down and form a saucy consistency, about five minutes. If nccessary, carefully mash fruit with a fork or masher until it reaches the consistency you'd like. Taste your jam and see if you want to add more sweetener. Add a tablespoon at a time until you hit the right sweet note for your tastes. Stir in the chia seeds and let cook for another minute. Stir again, remove from heat, and let sit until thick, about 10 minutes. If the jam seems a little thin, add another teaspoon or two of chia seeds, stir, and let sit for another 10 minutes, but keep in mind that he jam will continue to thicken as it cools. To store, place in an airtight jam jar or other container, and keep it in the refrigerator for up to two weeks. Can also be frozen for up to two months. Kare is a home cook, vegetarian, and mom who coexists with her otherwise carnivorous clan. Her blog, Kitchen Treaty, helps mixed-diet families keep the peace. Can you skip the cooking process but otherwise follow the recipe as indicated? I did this with fresh raspberries last year, and it worked fine, no cooking involved. I kept it in the fridge for a week, but there’s no reason why it could not have been frozen in small containers. Can I use frozen strawberries? Just wondering if I could make a larger batch and freeze it in glass jars? Thanks for you help! Wonderful recipe! I love that you can add sweetener just as needed. Our plum tree runneth over right now and this looked like a good way to use plums. It is…after initial batch I tripled recipe and made more. I washed and pitted the plums, pulsed them in the food processor a few times to break them into pieces so I wouldn’t have large pieces of peel in the jam. I used just 1 Tbls blackstrap molasses to sweeten. After I removed from heat I stirred in 1/2 tsp vanilla and 1/2 tsp cinnamon – ‘cuz I love plums with cinnamon. Absolutely delicious!!! Thank you!!! Love this recipe! I just made it using ~3/4 lb. strawberries and 1/4 lb. blueberries because that’s what I had on hand. Sweetened with a bit of orange blossom honey and it came out perfectly. So easy too! Hi there I came across this when I did a google search for chia seed jam. Was wondering if you have tried this with apples at all? Hi Melany, I have not tried it with apples. Usually I make applesauce and apple butter by more traditional methods – no added pectin or other thickener required what with apples’ naturally occuring pectin and the method that involves cooking down. But I’m intrigued by the idea! I did make a pear and plum version that turned out great, but that’s the closest I’ve gotten. If you try it, let us know how it goes! Looks so yummy!! But can we freeze it if we made too much? I found this recipe after I saw Word of Chia offering a commercial version and I wanted to make it myself. So it sounds like the chia plays the role of thickener so no pectic is needed, right? Their recipe has lemon juice. And I know some storebought jams have citric acid. Have you tried adding that bit of acid to this? I’m excited to try it! Just curious any variations, etc. Yes, you can freeze it. You can freeze most things. I love homemade jam especially with all the sugar. I love adding raw honey to this. I meant love making jam without all the sugar. Doing things all natural taste so much better. That Look and sounds Delicious ! Why don’t you recommend canning? It should be the same as canning anything else. Use a hot water bath, thereby pasteurizing your mixture, you should be able to can safely, just like any other fruit jams. They only difference with using less sugar is a shorter shelf life after the jam has been opened. Making this recipe right now with cherry plums from my yard! I’ve been grumbling all my life along with my Mom at the massive amounts of plums getting squished all over the yard…! Time to put them to use! I am going to try to make 3 varieties! Can’t wait to taste it! Made blueberry and strawberry chia jams but did not up use right away….grew mold and had to toss out. Wow! I love fruit spreads and Jams but don’t like the high sugar content, I cant wait to make this recipe! This recipe is totally amazing. I have tried so many chia jam recipes and they’ve not thickened properly. This one actually works!